OVERLAND PARK — High school students across the Kansas City metropolitan area have a new, accelerated path to a bachelor’s degree. 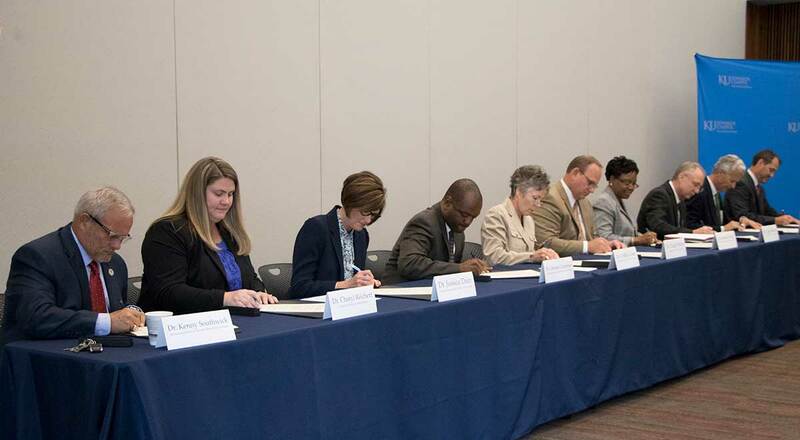 Area school districts and community colleges joined the University of Kansas to formalize the Degree in 3 program during a signing event June 12 at the KU Edwards Campus. Degree in 3 enables students from participating schools to earn a bachelor’s degree from an R1 research university in only three years. This new partnership potentially reduces students’ cost of earning a degree and accelerates their entrance into the Kansas City workforce or graduate school. Students earn college credits in high school, complete an associate's degree one year after graduating and complete an Edwards Campus bachelor’s degree two years later. Degree in 3 also gives Missouri students access to KUEC’s MetroRate. Eric Fecteau, a 2017 Blue Valley West graduate, is furthest along in the Degree in 3 journey. 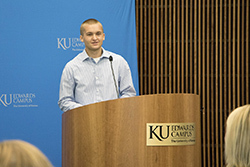 He took concurrent Johnson County Community College courses during his senior year and will potentially graduate from KU with his bachelor's degree in business administration in December 2019, which would actually make his time a "Degree in 2.5." He works full-time, building his landscaping business, while taking classes. Degree in 3 has grown in the three years since its inception. With more partners, awareness and the formalization of the program, its effect is widespread. See a Facebook Live recording of the event here. Right photo: Eric Fecteau, a 2017 graduate from Blue Valley West High School and Degree in 3 student in the Bachelor of Business Administration program, shares with the crowd the importance of this program for area students and how it will change lives.